NEW immigration rules which ban international students from working during their studies have been condemned by a city MP as a “grubby little measure” which is pandering to prejudice. From next month, students from outside the EU who come to study at publicly-funded further education colleges will lose the right to work for up to ten hours a week as part of a new Westminster crackdown on visa fraud. Ministers say the move is designed to stop student visas being used as a “back door” to the British jobs market. But Edinburgh East SNP MSP Tommy Sheppard said: “This is a shabby and pathetic device from a government which has taken mean-spiritedness to new heights. Under the new rules, the length of further education visas will be reduced from three years to two. And foreign students will be forced to leave the country as soon as they finish their course before applying for a work visa if they want to return to the UK. Critics have warned the government is risking serious long-term damage to Britain’s ability to attract international students. 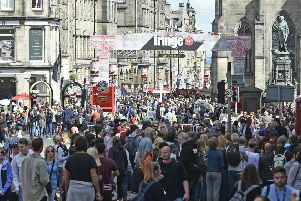 Latest figures show there are more than 10,500 international students in Edinburgh. Alastair Sim, director of Universities Scotland, said further restrictions on high-talent migration risked damaging not only Scotland’s educational institutions but the country as a whole. He said: “International students gain from studying here and, conversely, Scotland also gains from welcoming international students as they make an important contribution to our economy, society and culture. Audrey Cumberford, of Colleges Scotland, said the restrictions would harm the ability of colleges to attract international students. She said: “As publicly-funded bodies, colleges take pride in offering high quality vocational education for all and have rigorous procedures and processes in place for monitoring international students. “International students make financial contributions to our economy and enrich the experience of Scottish students by providing a more diverse pool of students, with a broader global perspective. “These further restrictions will damage Scotland’s standing as a destination for non-EU students, damaging the strong reputation for vocational education and training Scotland’s colleges have throughout the world.